This year – along with the rest of the country – I was completely and unashamedly gripped by the Great British Bake Off. I spent the summer wondering if anyone other than Richard would win star baker, worrying whether Martha would pass her A-levels and recovering from the baked-alaska scandal. And when, surrounded by friends and family (hers not mine), Nancy was crowned star baker, I admit to shedding a tear…or two. So, with my GBBO obsession in full swing, deciding to host my very own bake-off seemed like a no-brainer. Contestants were instructed to bring over their most showstopping creation with the chance of being crowned star-baker. 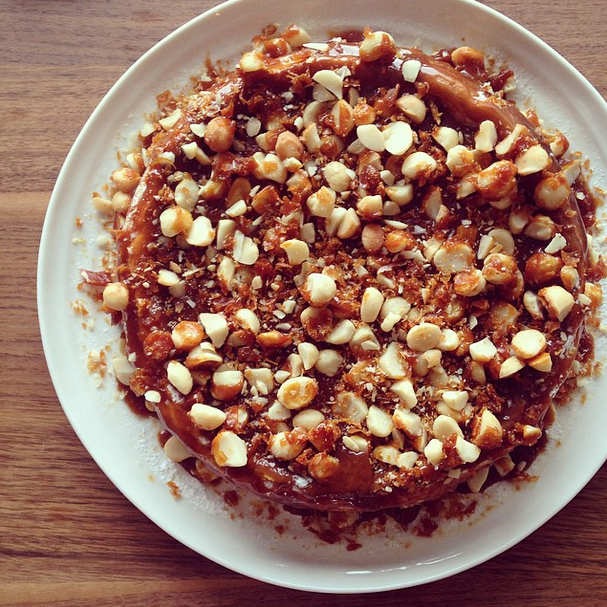 Now all I had to do was choose what to make and after little success trawling the internet and various cook books for inspiration I ended up making something I’ve had my eye on for years, Ottolenghi’s caramel and macadamia cheesecake (I’ve included a pic above!) Why, you may ask, has it taken me 6 years to try this out, well, cos making caramel is scary guys, and this recipe requires two different types! 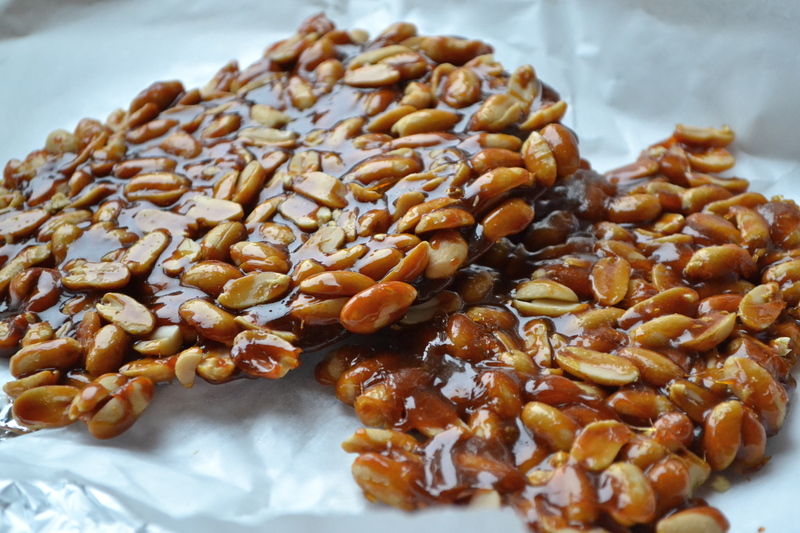 Despite my initial trepidation, I found that mastering caramel is actually pretty easy – so long as you follow the right guidelines – and have since gone on to tackle a whole host of recipes, my favourite being the salted peanut brittle that you can find the recipe for below. I thought this addictive treat would make the perfect DIY Christmas/Chanukah present…Enjoy! Makes two large slabs of about 15cm x 15cm. Start by lining a baking tray with greaseproof paper. TIP 1 | It helps to use a light coloured pan so you can see the colour of the caramel and catch it at just the right time. Gently heat the pan and DO NOT STIR. Simply wait for the sugar to melt and turn into a golden caramel, this took around 10-15min so don’t panic if it takes a while. 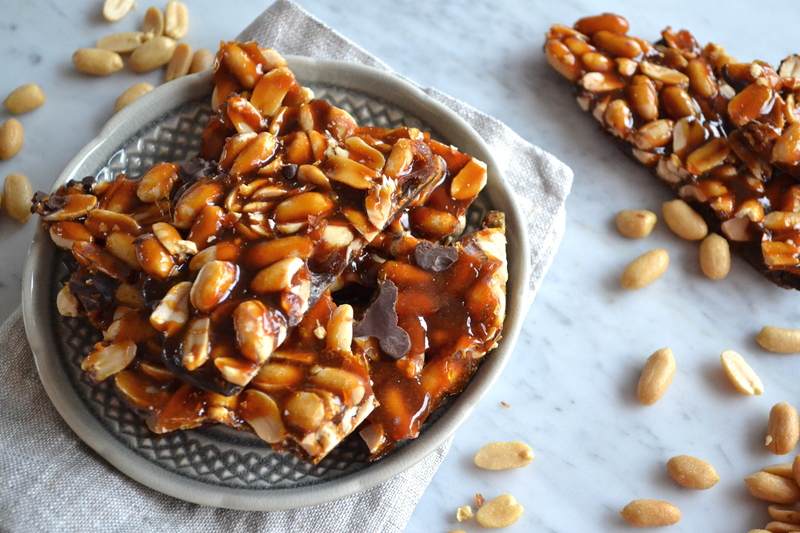 Once the caramel is a lovely golden brown quickly take off the heat, tip in the peanuts, stir to coat and pour out onto the lined baking tray. Shape into a loose rectangle with a silicone spatula and flatten down into a slab. This process has to be done fairly quickly as the caramel seems to harden pretty fast. Once your caramel has hardened and cooled, melt the dark chocolate in a heat-proof bowl over a simmering pan of water. 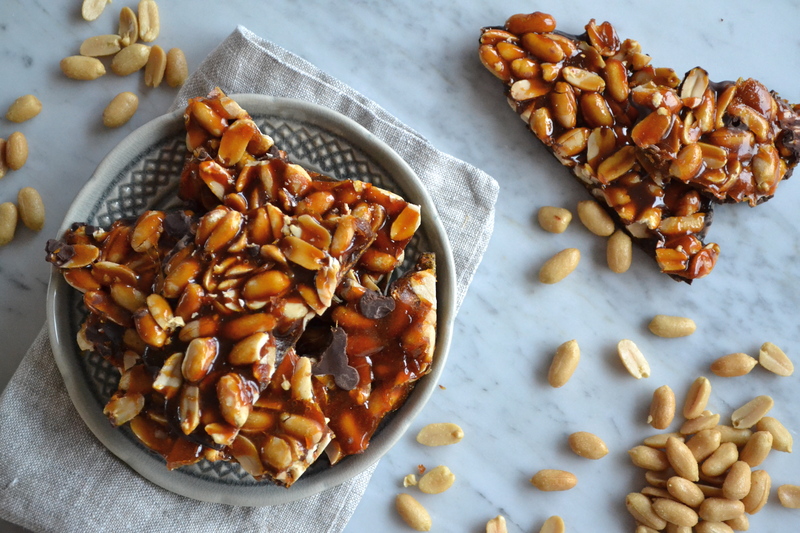 Take off the heat, flip the peanut brittle over and brush the smooth side with melted chocolate. If you don’t have a silicone brush I’m sure you could just pour the chocolate over. Leave to cool, chocolate side up, and then, using a sharp knife, cut into shards of brittle. For other DIY gift ideas check out the dark chocolate, cherry & ginger cookies I gave to my family last year.